Ask any Indian women about their favourite Indian wear. A saree will be a clear winner. The 6 yards long piece of cloth is not only ethnic and traditional but is considered as sensual attire too. 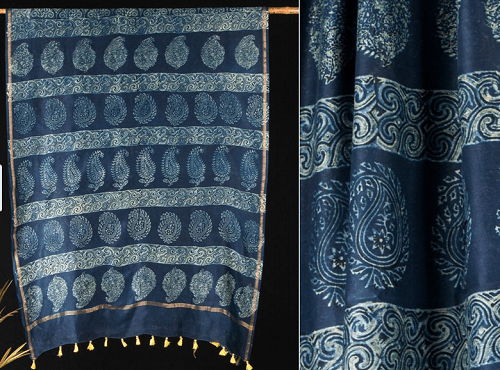 Ajrakh Sarees are made from a traditional block printing designing technique. The complex patterns are designed by hand using block printing by stamps. For keeping colours fast and even, the manpower is required to be highly skilled and concentrated. It can take up to 2 weeks to complete the whole process. According to local printers Ajrakh means “keep it today.” Some even links Azrakh as the Arabic word for indigo. Indigo is a blue plant which grew in the adverse conditions of Kachchh until the 1956 earthquake. “Ajrakh” can also be said to have get meaning from the Sanskrit word “a-jharat”, which means one that does not fade. The dyes used are Natural Dyes which are non-toxic. Traditionally these patterns are said to have backgrounds including colours like indigo blue, crimson red and black. Though, Ajrakh Sarees are no longer limited to these colours. Ajrakh is not only used to design sarees but also shawls, turbans, lungis, or stoles. Here we present 10 Ajrakh inspired saree designs that you can use for your next special moment. With the rare Ajrakh print on the beautiful Gajji silk the saree gets a beautiful shine to it and it drapes like a crepe silk saree. The Ajrakh hand print using natural dyes on a blend of mulberry silk and malai cotton is an ideal match for Ajrakh patterned saree. Modal is a luxurious, lightweight and smooth silk material. The Ajrakh print combined with this lustrous shine is a treat to the eyes. This classic Ajrakh style of saree is a proven head-turner whenever you will step out draping it. The cotton fabric is a natural fabric and is a light fabric for the body. The beautiful handloom block printed saree is an ideal example of elegance and class. The old age Ajrakh print combined with samo silk compliments each other. What can we say for this tassel included saree? 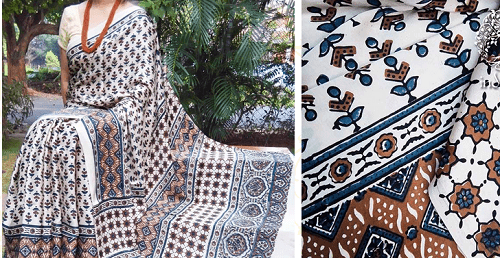 The pure chanderi silk and ajrakh print is an example of master craftsmanship. The saree designed by ajrakh craftsmen from Bhuj, Gujarat has been designed on pure rich and lush Maheshwari Silk fabric, which is commonly used in Gujarat. The saree designs are inspired by mughal mosaic and cage carvings on the Taj Mahal. This saree is made by Artisans in Barmer, Rajasthan and have a Mughal touch in its design. The color options make it an ideal choice for a saree. A contemporary piece made on Mulberry Silk with Spun Silk Stripesdefinitely deserves to be in our top 10 list of Ajrakh saree designs. With a starry block design in the colour black this piece must be a limited edition. The thin black border makes it stand out in the crowd. This rare and old art style is a must try. Just put some efforts to style these sarees with different accessories and jewellery and you are ready with the elegant Ajrakh look.